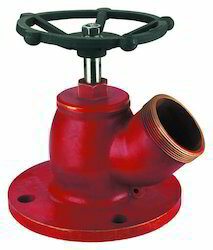 With our in-depth knowledge of this domain, we are actively engaged in offering an excellent quality assortment of Double Headed Hydrant Valve. - Accessible in standard sizes of 63 mm, 52 mm and 38 mm in breadth, these meet the differing prerequisites of our regarded clients. Clients can avail from us a wide assortment of Oblique Flanged, which is manufactured using optimum quality raw material and latest technology under the guidance of our professionals. It is used to control the water pressure. 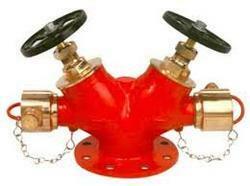 In order to meet various requirements of the clients, we offer product in various specifications. - Screwed in bonnet having instantaneous coupling with single outlet. - PTFE Gland Packing for longer life and smooth operation. - Large Flow Of area to get full flow of water. - Conforming to Type-A specifcation.